Can’t come to the museum? 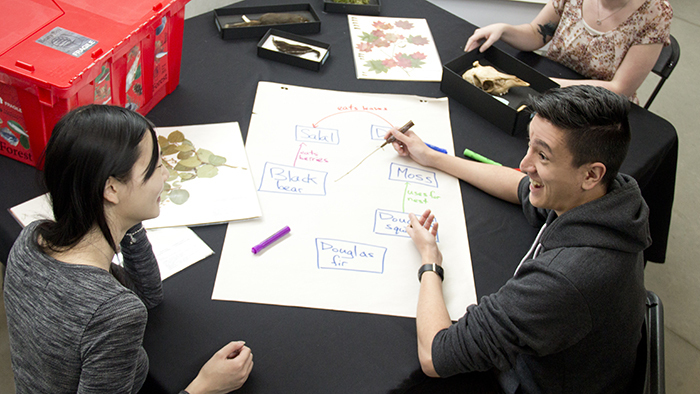 Book one of our Beaty Boxes, outreach kits with touchable specimens, information about UBC research scientists, and hands-on activities that explore biodiversity. 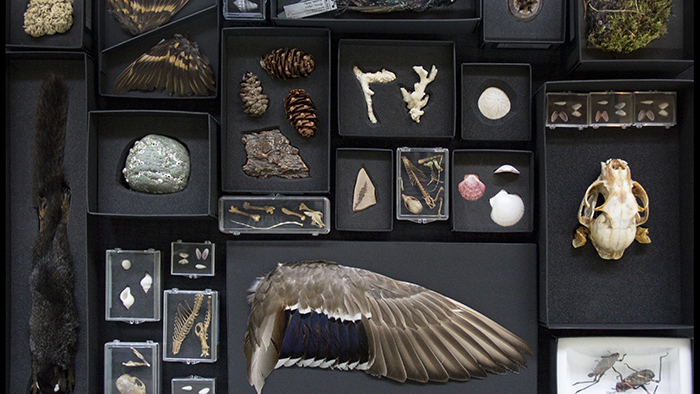 Our outreach kits provide you and your students with the opportunity to connect with the Beaty Biodiversity Museum’s unique biological collections. 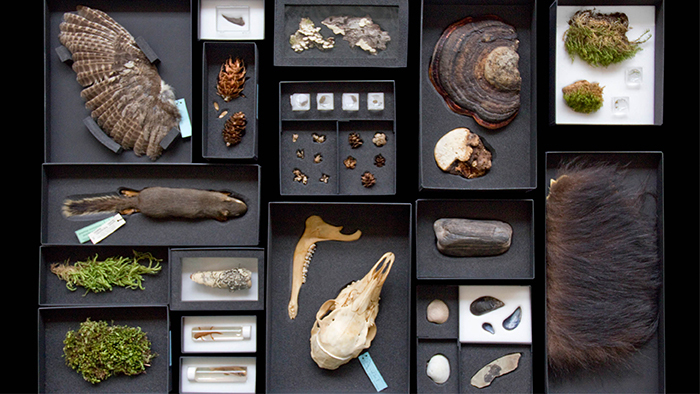 All Beaty Boxes contain touchable specimens and other scientific objects to stimulate inquiry and discussion within the classroom, enhancing the student learning experience. Schools, community centres, libraries, home-learners, and other groups are encouraged to book a box and share it with other classes in the school or institutions in their immediate area. This can be a cost-effective way to share resources in the community. Each Beaty Box is available for 14-day booking periods, including pick up and drop off dates. Please review the Policies & Procedures tab for information on reserving, picking up, and returning your box. Note: Beaty Boxes are unavailable during July & August as we perform repairs and maintenance. Stay tuned for updated availability and new boxes launching Fall 2017! Boxes are available for 14 calendar day rentals (Tuesday the 9th through to Tuesday the 23rd, for example). The 14-day rental includes the pick up and drop off date. In the example above, you would pick it up on the 9th and drop it off on the 23rd. All bookings must be completed via the appropriate online request form. Please note that the form is an online request only and is NOT a confirmed booking. You will receive an email invoice confirming your booking dates and invoice outlining rental fees and deposit details. Rental is $75.00 for 14-day rental, and $50 for each additional and consecutive 14 calendar day period. Cost assistance may be available; please indicate on the online form. Pick-up only, shipping is not available at this time. Extension on the rental period may be available after you begin your rental, depending on availability, but we suggest indicating the full rental period on the request form. A $35 deposit per box is required upon booking. This can be paid by cheque (payable to the University of British Columbia), credit, cash or debit in person at the Museum, credit over the phone, and JV for internal UBC departments. The deposit will be applied towards the rental fee. Full payment due upon return of the box. The person who books the box is responsible for the box’s return to the museum. If the person who is picking up or dropping off the box is not the person who booked the box, please fill out the pick-up/drop-off section of your contract, and send it to us via email or fax. The person picking up the box will need to have photo ID that matches the information provided on the booking request so we can ensure the box goes to the right place. Boxes are easily transported in a car, taxi, car-share vehicle, carried on public transit, or packed with tight padding in a bicycle trailer. Please see the details on the website for each box's dimensions and weight: Forest, Inquiry, Whale Flipper X-Ray. At this time, the boxes cannot be pick-up by couriers or mailed. The Beaty Museum does not include transit, parking, or other costs in the Beaty Box fee. You are responsible for protecting Beaty Box and contents from excessive moisture and other agents of deterioration. If it is raining, please bring a large plastic garbage bag or towel to drape over the box to prevent moisture damage. Shipping is not available at this time and the boxes cannot be pick-up by couriers or mailed. The boxes must be held upright to prevent specimen damage and are not packed for the postal system. Boxes are available to use in Canada only at this time. They are not permitted to cross USA-CANADA or other international borders. Before returning the Beaty Box, please check that all materials are included and carefully packed as per the manual and checklist. You are responsible for any lost or damaged items and may be charged up to a $100 replacement fee for items that are lost or for extensive damage. Beaty Boxes should be returned to the museum by 4:30 pm on the due date indicated on the invoice. There is a late return fee of $35 per day. Boxes returned before the due date will not receive any refund. In certain circumstances the Beaty Biodiversity Museum is able to offer non-profit, charitable organizations and inner-city, low socioeconomic schools and organizations discounted rates (maximum 25%) on top of the stated rental rate. Funds allocated for these initiatives are limited. If you feel your group qualifies for this discount, please identify in the online booking form. If you are unable to pick up or return your Beaty Box on the scheduled date, or if you decide to cancel your reservation, please call the Beaty Museum Front Desk immediately. Cancellations or changes should be made at least two weeks (14 days) before the scheduled mail or pick-up date; changes are subject to availability. Cancellations or changes made less than two weeks before your rental dates will forfeit the $35 deposit. To ensure we serve you to the best of our ability please complete the request form, thoroughly and clearly. Please provide any information about your classroom that may be of use to the museum - including grade, size, and special needs details. Subject to availability. Please note there are multiple boxes available for each type, but each box of a type has the same contents. For example, "Inquiry 01" and "Inquiry 02" contain the same specimen but may have different availability. The museum is closed Mondays and Stat holidays. In certain circumstances the Beaty Biodiversity Museum is able to offer non-profit, charitable organizations and inner-city, low socioeconomic schools within the Vancouver School Board discounted rates (maximum 25%) on top of the stated group program rate. Funds allocated for these initiatives are limited. If you feel your group qualifies for this discount, please identify here. Provide any additional details that site staff should be aware of. With a focus on ecological conditions, learn more about the Pacific coastal temperate rainforest. Focus on creating visual representations to record scientific observations with the Inquiry Box. 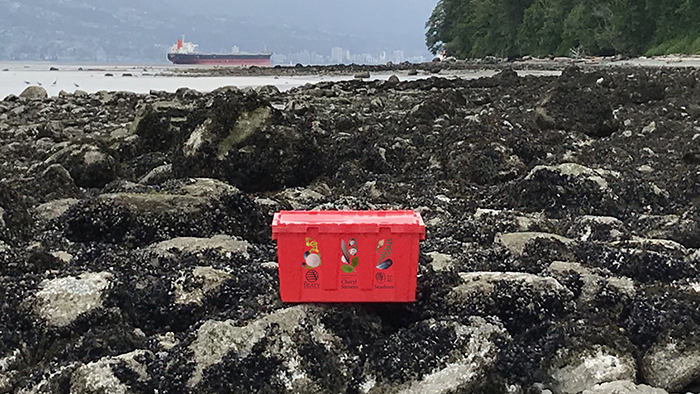 Learn all about interactions between organisms and their seashore environment and more with the Seashore Beaty Box. 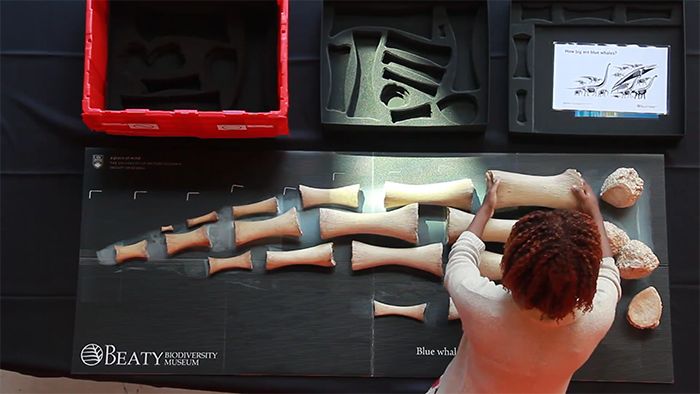 Observe and compare blue whale flipper bones to the bones of the human hand.